Nantucket might sound pretty far for a California girl to travel to go to the beach but over twenty years it's become a family tradition and the place where I recharge my batteries. Having downtime to decompress, unplugging from technology and everyday demands are not only critical to ones overall mental and physical well-being, but it's also key to my personal environmental health. The island has preserved its natural beauty with beautiful beaches, windmills, lighthouses and cobblestone streets. Just 47.8 square miles there is not much need for a car, so I rarely use one, preferring to use my bicycle to get around town. 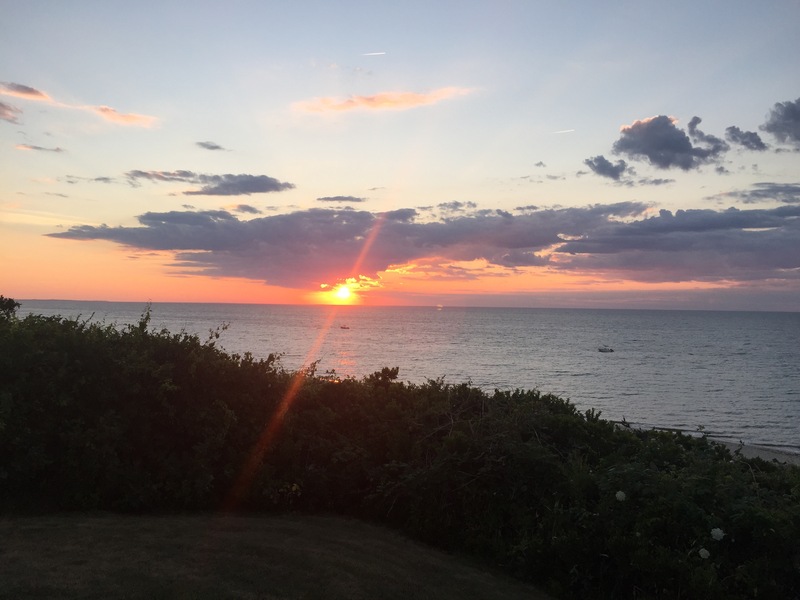 Nantucket's activities are so engaging that it is the perfect setting to turn off the cellphone and watch the sunset while enjoying a picnic dinner from Something Natural out on Great Point. Nantucket is also filled with memories of my children growing up - another subtle reminder to slow down and be present. I've been pregnant here, lying like a beached whale under an umbrella, wandering through Bartlett's Farms with toddlers hanging off my shopping cart, and sipping ice tea as if my life depended on it after a sleepless night. My children all learned to ride bikes on the island. We've spent time at the library story hour, visited the Whaling Museum on rainy days, had family movie nights at the Dreamland Theater, attended lectures at The Atheneum and church services at the Union Chapel. We go fishing for bluefish and strippers at Just Do It Too and turtling in swamp water. Each season we try the new restaurants, and when our children were younger, we would bike to The Downyflake Donuts. There is a lot about Nantucket that makes it qualify as one of my happy places. But beyond the bike rides to Sconset, tennis, and yoga and lazy afternoons in the shade reading a book, the best part for me of my Nantucket escape is the part that I can't see or touch. It's the feeling I get from allowing myself the luxury of letting my body recharge and indulge in serendipity instead of schedule, turning off not just the computer but also my brain so it can reset to its naturally creative self. As an advocate for environmental health, I know that means more than being a conscious consumer and eliminating toxins from our food and air and water. It's also about purity in spirit which is something I find easy to access in Nantucket, dressing simply, wearing no make-up, spending time with friends singing at karaoke night or laughing while playing a board game and sitting on a porch at sunset and letting my mind detox and my soul refresh. Nantucket is a place where I can breathe fully and just be. Each year when I leave on the ferry to Hyannis we throw an auspicious penny into the harbor in hopes we will return next summer. I remind myself that I don't have to wait until next summer to recharge my batteries. There are many things I can make a commitment to incorporate in my weekly routine that will improve my environmental health. The research has shown that just twenty minutes a day being outside in nature can significantly boost vitality levels. A picnic in the park with friends or family, a hike, a walk or even sitting under a tree on a bench without the company of a cell phone can make a world of difference. A weekend without social media, cell phone free dinners and my self-imposed rule of no screen time after eight o'clock all help to restore that feeling I get while on Nantucket. Whatever recharging your batteries means for you, I'm advocating you do it. Surrender your electronics for awhile, get out in nature and stretch your legs, breathe deeply and fully and let life flow in. Work and school and all the obligations of our human existence will always exist but taking extra time to just be, not just during the summer but all year round, will go a long way towards improving your personal environmental health.